The SplashFlash is a waterproof dual function flashlight with 25 lumens output through a specially designed "globe" lens for 360 degree illumination. 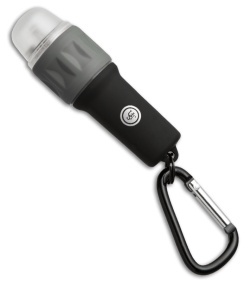 This multi-function light with SOS mode works a as a flashlight, mini lantern, safety light and a personal locator light. It features impact resistant ABS housing and waterproof double o-ring construction. The included carabiner clip makes it easy to attach the SplashFlash to your gear or even a key chain.